One of the most popular helps for the symptoms of menopause, evening primrose oil, is very controversial. While large numbers of women attest to the value of this natural remedy for menopause discomfort, many medical studies are inconclusive. What is the truth? There have been numerous medical studies on the effects of evening primrose oil on the symptoms of menopause. BMJ, a medical journal, cites a study done in England on fifty-six women. Half were given evening primrose oil and half were given a placebo made up of liquid paraffin. The study sought to see if evening primrose oil caused a decrease in the number of hot flashes and sweating episodes during the period of six months. Of the fifty-six women, only thirty-five completed the study. In reading the daily diaries of these women, researchers concluded that evening primrose oil had no significant effect on the symptoms of menopause. In 2002 researchers at Columbia University did a study analyzing the various studies that had been done on menopause, evening primrose oil being the primary supplement involved. Their conclusion was that evening primrose did not relieve the hot flashes and sweats that are common in menopause. Women are not convinced. Numerous women take evening primrose oil on a schedule that is different from the schedule prescribed by the researchers and have reported significant relief. These women are taking one 500mg capsule every day for two weeks and then four 500mg capsules every day for the one week prior to menstruation, and then no capsules during the week that menstruation occurs or should occur. By maintaining this routine women report a decrease in the discomfort that they had been experiencing from menopause. It takes from four to six weeks to notice a discernible difference in the symptoms and can take from four to eight months of continuous use to reach the level of maximum benefits. 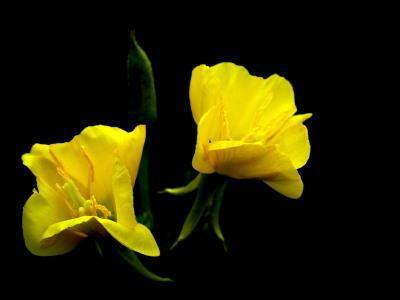 Evening primrose oil is derived from evening primrose, a flowering plant that blooms at night. It has high levels of gamma-linolenic acid (GLA), an essential fatty acid that is related to the omega-3 family of fatty acids. It has few side effects or drug interactions. It can cause bloating in some sensitive individuals. It may increase the instance of temporal lobe epilepsy in patients taking certain medicines for schizophrenia. Evening primrose oil can cause the symptoms of mania to worsen. It may alter the composition of breast milk. While evening primrose oil is helpful in relieving the symptoms of premenstrual syndrome, peri-menopause, and menopause, it is most effective when used in combination with other remedies. In this way a wide variety of symptoms are relieved and each remedy is more effective. Blessed thistle balances the hormones and stops hormone-induced headaches. Damiana restores a lagging libido and controls hot flashes. Kelp helps the thyroid and adrenals to function properly and keep menopause weight off. Red raspberry leaf strengthens the uterus and helps guard against a uterine prolapse. If you can't locate it in your area these Internet stores carry many different brands of evening primrose oil in different strengths. While traditional medicine has ruled out this herb for the relief of menopause, evening primrose oil continues to be popular among menopausal women. If you are having symptoms of menopause, try evening primrose oil for six to eight months and see if it will work for you.